These extremely gentle "dragons" come from Australia. Their name is derived from the way they enlarge the flap under their chin or lower jaw. When enlarged it resembles a beard. Due to their docile, trusting and affectionate personality they make a great pet for the experienced as well as the beginner including young children. Full grown, the bearded dragons reach 16" to 20" but have been known to grow as big as 24" to 30". Housing Young "beardies" can be kept in a 10 to 20 gallon tank but this will not last long due to how quickly beardies grow. Sometimes up to 1/2" a week for the first 2 to 6 months. So if you are going to buy a tank go ahead and buy one that will last through adult hood. I particularly like to use a cage that is 4' x 2' x 2'. This allows plenty of room to excercise and utilize the whole cage for different temperatures. I would never go less than a 55 gallon tank. Ensure that at a minimum the top of the cage is made of some type of screen to promote good air circulation and prevent trapping humidity inside the tank. Make sure that there are plenty of logs in the tank for basking. Substrate Avoid using reptile bark. This is a common mistake and could possibly be fatal to your beardie. While eating, your beardie could accidentally ingest a piece of the bark which can cause stomach problems leading to loss of appetite and possible death. Newspaper is an option, contrary to popular belief the ink is not toxic but will cause some dirty feet and does not make for an aesthetically pleasing tank. Reptile carpet is a very good alternative, it looks good and is easy to clean but I prefer childrens play sand. This is without a doubt the best looking floor for you cage and it is easy to spot clean. It works almost like kitty litter would. Just be sure to use the fine grain as others may have small pebbles which could hurt you beardie. Lighting Lighting is extremely important for your beardie. They require a minimum of 12 hours a day of full spectrum light. This can be achieved with a 5.0 or 8.0 fluorescent bulb. This bulb should be placed inside the cage or on top of the cage so long as the light does not pass through any glass as the glass it will filter the light not giving the beardie the light it needs. Heating To produce the heat your beardie will need, I recommend using a ceramic heat emitter. This can produce a constant source of heat. If you use a regular household bulb you will not be able to simulate nighttime. And as said earlier you need a fluorescent bulb anyway so that will be your light source. As with all heat emitters you must use porcelain dome fixture due to the amount of heat the put off. The ideal basking temperature should be between 95F and 105F with the cool side of the cage being about 85F. Never use a heat rock in your beardies cage. 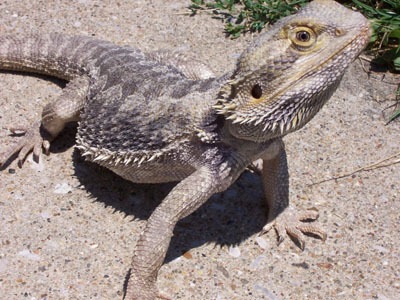 They absorb heat and do not feel heat even of they are burning so a heat rock could seriously burn your beardies belly. Feeding There are so many different opinions out there for feeding beardies. You can go to four different websites and get four completely different suggestions. Well they are probably all right. What I am about to suggest is what has worked for me. Babies should be fed crickets twice daily. The crickets should be smaller than the space between their eyes. Give your beardie an amount of food that it can consume in 5 minutes. This will be anywhere from 20 to 60 crickets. You should also offer greens daily between feedings and these greens should be sprayed with water to keep your beardie hydrated. Greens consist of Dandelion greens, collard greens, mustard greens, kale, Turnip greens ext. Sub-Adult to adult beardies should be fed once daily and should consist of larger crickets. Locusts, mealworms, waxworms ext. can also be offered at this time but as a treat not as their staple diet. Do not feed the roaches you find in your house however, or any other insect you catch in the wild. Once a week you should also "dust" your prey with a calcium/D3 supplement and a multi vitamin supplement. Vegetables can also be given to your beardie but if you use carrots keep it to a minimum as too many can cause vitamin a toxicity. Beardies are omnivores which means they will eat meat as well. Pinky mice can be offered but not often, maybe twice a month. If your beardie will not take it do not force it by not giving it anything else to eat. Water Fresh water should be offered at all times in a very shallow bowl. Some beardies will not drink out of a bowl. This is why it is imperative to spray your greens when offered as they will get hydrated when eating them. You can also bath your beardie once a week as this will assist in hydration as well as shedding. 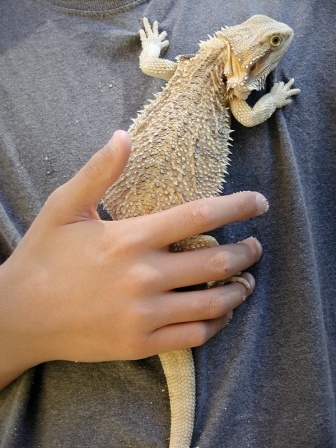 Handling Handle your beardies often and for long periods of time. Allow the kids to hold these guys to. They can be extremely affectionate and love to be held. When it is warm outside take them out. Show it off to the neighbors, they will love you for it. Now that you have the basics, I hope you can enjoy all there is to enjoy with your beardie.